Being alerted of end user experience issues prior to their customers. Understanding the exact business function impacted with reproducible detail. Comparing their technology upgrades and the impact on their end user experience. Understanding the performance of their applications across browsers and devices. 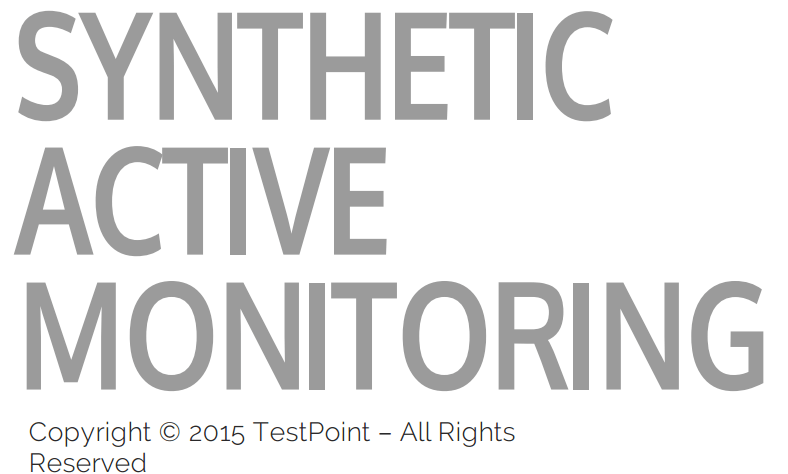 Synthetic (Active Monitoring): Collecting data from dispersed agents which simulate the way real users interact with your applications. Real-user (Passive Monitoring): Collecting data from real users based on the actual experience and behaviors as users are interacting with your application. 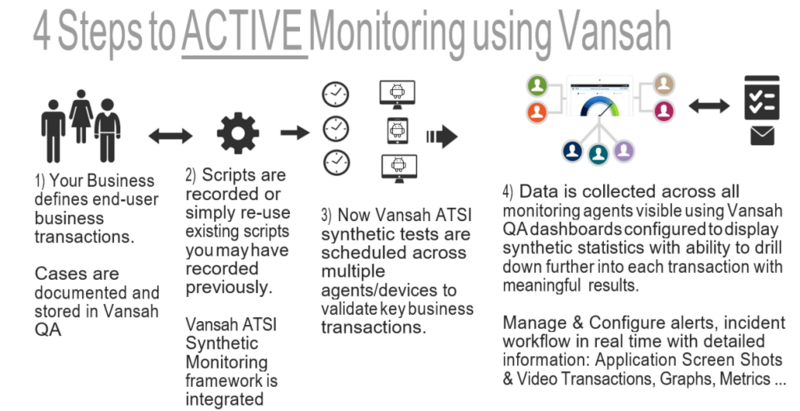 TestPoint’s Proprietary and exclusive Synthetic Application Monitoring (VSAM ™) Solution allows you to proactively test your web, non-web, legacy, citrix, mobile, streaming and cloud-based applications in staging & production environments to ensure performance will meet your end user requirements. VSAM ™ Tests can be executed to match the profile of your end users, globally in all locations, across multiple real browsers and devices. This is accomplished through a combination of running synthetic tests from desktops or servers running on the Internet backbone including private agents located anywhere inside or outside your firewall. VSAM ™ leverages off proven script design capabilities available within the industries most trusted functional automated testing tools such as (QTP, UFT, TestComplete, SoapUI, Selenium, SilkTest, RFT, Telerik, Tosca and more) or the choice of inbuilt scripting engine, to instantly create powerful monitoring profiles across complex business applications (legacy, cloud/web, mobile) run from any network even simulating cross sites/geographic networks. 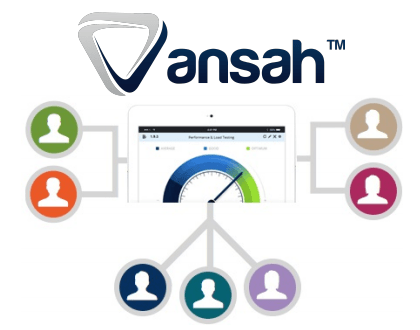 The power of VSAM ™ can allow you to monitor webpages, application forms including specific business transactional functions for up-time and performance. VSAM ™ simulates real business transactions within your environment actively monitoring the performance, availability and verification of your KPI’s, events for each business transaction alerting and reporting with drill down charts to specific pages (with screen shots), business requests and performance responses. Taking it one step further VSAM ™ introduces video replay recordings for a particular event allowing you to replay the transaction at any point in time to understand and diagnose the root cause of the performance and availability issue. Measure. Understand “before-and-after” performance when upgrading or implementing virtual infrastructures, consolidating data center and migrating servers. Isolate problems. Isolate problems by location, server and application for immediate real time identification of the transaction. Ensures availability. Reduce the impact of end user outages and performance issues. Notifications and Alerts. Provides real time alerts for outages, performance and security issues. Real User Monitor behaviour.Measure real-user experience with detail helping you replay transactions. Business Transaction monitoring. Replicates real-user transactions across any application (cloud, mobile and web applications including Oracle® Siebel, PeopleSoft, SAP, Citrix, Office 365 and others) and location inside or outside your firewall. Mobile App. Monitor any application with your own iOS or Android App. Receive push notifications for any event, drill into charts and notify your team with comments to collaborate on the issue. Drill down into synthetic reports. Application Screen Shots and Video transaction for a particular event allowing you to replay the transaction. Report on Historical Trend of Response Times over a defined period and application. Integrate with your existing development or test environment. Run in sync with your planned load or automated testing effort and report back on real end user performance response times. Collaborate on any business transaction and add comments to explain a spike. Information is available at a single click for future reference to explain what was done to look into a problem, resolve the issue or explain the reasons for the why a sudden increase in performance. Unlimited dashboards for KPIs, events, application and performance of your application/s. Drill down beyond business transactions to specific application pages with screen shots.